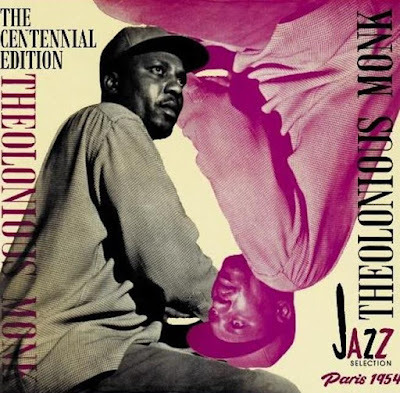 Marking Thelonious Sphere Monk’s centenary, an album of two halves, one live, the other studio, taped in 1954 in Paris. The city is hosting its third Salon du Jazz, an extravagant fête featuring multiple schools of jazz, movies and the Salle Pleyel interior transformed into a New Orleans thoroughfare. Monk, invited to star, embarks on his first trip abroad, but arrives sans rhythm section. Barely an afternoon exists to rehearse a local bassist and drummer, neither of whom are au fait with Monk’s music. The rhythm section’s inexperience and Monk’s temperament (c.f. : Mrs Nellie Monk’s comment: “every day with Thelonious is a new chemical experience”) form a combustible mixture which flares in the second chorus of Well, You Needn’t (live version). Abruptly, Monk vacates the piano stool and points an accusatory finger at Jean-Louis Viale, the hapless drummer. Seeking counsel, the horrified Viale glances at the bassist who, unhelpfully, offers only a Gallic shrug and ceases to pluck. Silence. Mystified audience. But Monk’s finger remains pointing. Reduced to insensate panic, Viale blunders into a haphazard solo, probably not Monk’s intention. As the ill-advised racket subsides, Monk returns to the keyboard to complete the tune, but more banana peels lurk (including the sleeve-note proof-reader permitting ‘segue’ to be spelled as ‘segway’). At a subsequent concert (the second incomplete ’Round Midnight), further disasters are averted by replacing Viale with Gerard Pochonet. No surprise the live tracks have remained unreleased for over sixty years. However, in the studio half of the album, anxiety gives way to joy in the shape of nine glorious unaccompanied tracks, eight Monk originals plus Jerome Kern’s Smoke Gets In Your Eyes (more detail of previous releases of this material here). For the first time, Monk’s potential as a solo artist is recognised and, stripped of support, fully exposed, his genius is clearly revealed. The idiosyncratic melodies, oblique dissonances, percussive attack, unpredictable twists (channelling Jimmy Yancey?) and deft rhythmic shifts amount to more than a ‘style’, they’re an entirely new musical language. On these remarkable tracks, it sounds freshly-minted (fortunately, because, during a tech crew strike, studio microphones are positioned by amateurs). While the engineering is O.K., the fee isn’t. Yet that doesn’t prevent Monk from blowing the lot on genuine French berets (bopper haute couture) to feed his lifelong headgear fetish. Moreover, during this eventful week, Monk has his initial encounter with Baroness Pannonica de Koenigswater (nee Rothschild), destined to become his guardian angel, notably during a nearly catastrophic drug bust and, later, his long, tragic mental decline. Acquire this historical document and marvel. Main tracks: Thelonious Monk, piano, June 4, 1954. Bonus tracks: add Jean-Marie Ingrand, bass; Jean-Louis Viale, drums, live at Salle-Pleyel, June 1, 1954. On final track, Gerard “Dave” Pochonet, drums replaces Viale, Salle Pleyel, June 3, 1954.